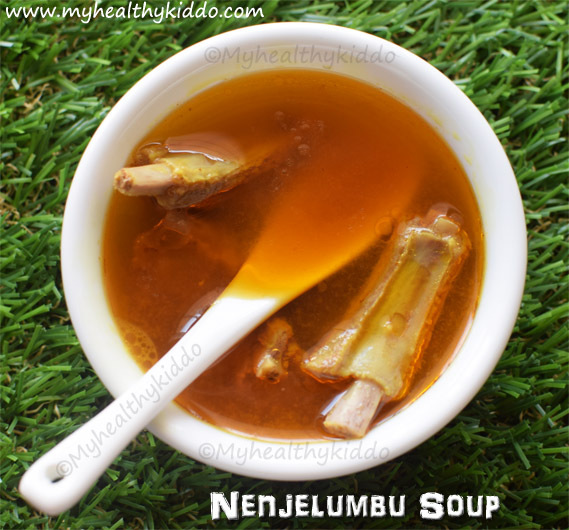 Nenju elumbu soup or maarkanda elumbu soup or nenjelumbu chaaru is mutton rib bones soup. It is good for cold and cough. Nenjelumbu soup is given for people recovering from surgeries and to moms post delivery. 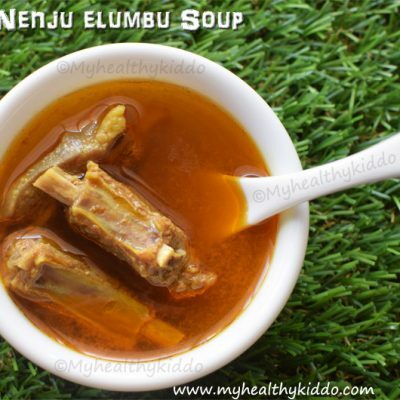 Nenju elumbu soup is specially given to growing kids, puberty-attained girls and feeding moms. Nenjelumbu soup will be the first choice for sick and weak persons. It is said to boost immune system. 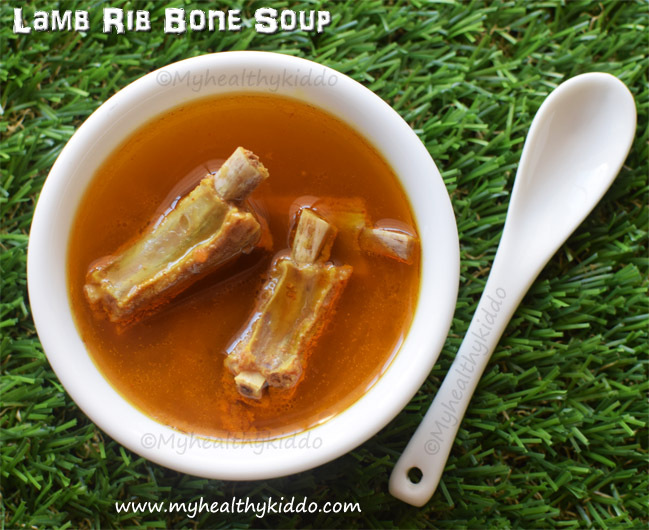 Mutton rib bone soup is more tastier and healthier than normal mutton soup. It can be given for babies from 10+ months. This soup can be enjoyed during pregnancy too. Click here for chicken soup recipe. Wash the mutton ribs twice and then add salt, turmeric powder & lemon along with water. Mix well and leave it for 5 mins. Drain the water and wash again with plain water. In a plate, take 1 inch cinnamon/pattai, 1 or 2 clove/krambu, ¼ tsp each of pepper/milagu, cumin/jeeragam, aniseed/sombu. Wash curry & coriander leaves and keep ready. Peel 8-10 small onions, 3-4 garlic cloves. Wash and chop 1 ripe tomato. Crush onions and garlic cloves using back of kitchen knife or coconut knife(as in pic) or pestle. In a pressure cooker, take washed mutton ribs and add the plate of whole spices. Add crushed onion & garlic, chopped tomato, washed curry & coriander leaves. Add ½ tsp heaped coriander powder, ¼ tsp turmeric powder and ½ tsp leveled chilli powder. Add ½ tsp sesame oil/nallennai and 2 cups water. Add ½ tsp kosher salt/kalluppu and cook in medium-high flame(knob #8) for 8 whistles. Once pressure is released naturally, drain the soup to a bowl(with few pieces, if required) and serve hot/warm. 1.If you are making it for babies, do drain it using a strainer as whole spices or tiny bones might cause choking hazard. Decrease the spices. Salt is recommended for babies below 1 year of age. Click here to know why ? 2.Consume immediately when it's still warm. If you want to have it after sometime, do reheat and have warm. 3.You shall replace pepper powder and jeera powder in place of whole spices. 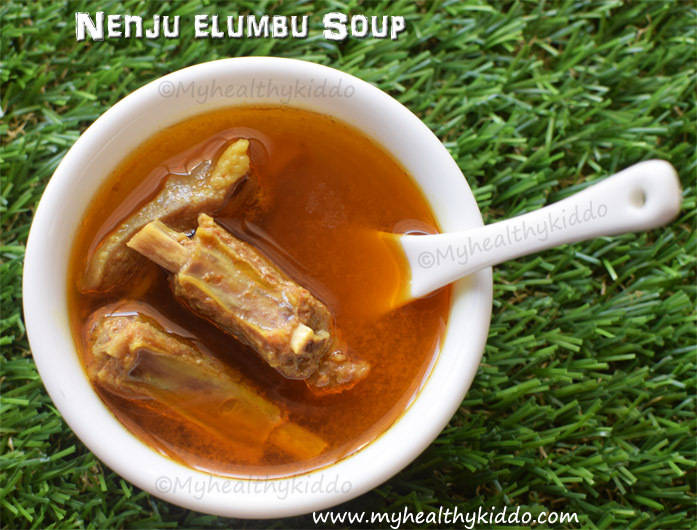 Preparation – How to make nenjelumbu soup? 1.Wash the mutton ribs twice and then add salt, turmeric powder & lemon along with water. Mix well and leave it for 5 mins. Drain the water and wash again with plain water. 2.In a plate, take 1 inch cinnamon/pattai, 1 or 2 clove/krambu, 1/4 tsp each of pepper/milagu, cumin/jeeragam, aniseed/sombu. Wash curry & coriander leaves and keep ready. Peel 8-10 small onions, 3-4 garlic cloves. Wash and chop 1 ripe tomato. 3.Crush onions and garlic cloves using back of kitchen knife or coconut knife(as in pic) or pestle. 4.In a pressure cooker, take washed mutton ribs and add the plate of whole spices. 5.Add crushed onion & garlic, chopped tomato, washed curry & coriander leaves. Add 1/2 tsp heaped coriander powder, 1/4 tsp turmeric powder and 1/2 tsp leveled chilli powder. 6.Add 1/2 tsp sesame oil/nallennai and 2 cups water. 7.Add 1/2 tsp kosher salt/kalluppu and cook in medium-high flame(knob #8) for 8 whistles. 8.Once pressure is released naturally, drain the soup to a bowl(with few pieces, if required) and serve hot/warm. Use the remaining cooked mutton ribs to make usual Mutton gravy recipe. Click here for link. If you are making it for babies, do drain it using a strainer as whole spices or tiny bones might cause choking hazard. Decrease the spices. Salt is recommended for babies below 1 year of age. Click here to know why ? Consume immediately when it’s still warm. If you want to have it after sometime, do reheat and have warm. You shall replace pepper powder and jeera powder in place of whole spices.